Over the past decade or so, record collectors in Europe and the U.S. have discovered 70s psychedelia from Turkey, where artists including Cem Karaca, Erkin Koray, Selda Bagcan, Mogollar, and Fikret Kizilok remade traditional songs or styles from the country's middle region of Anatolia with modern instruments from the West—electric guitars and keyboards. I have no doubt there are still plenty of undiscovered artists who created music in a similar vein, but at the same time, I'm glad to see another kind of Turkish music from the 70s, which is only superficially related to psychedelia, getting the reissue treatment. 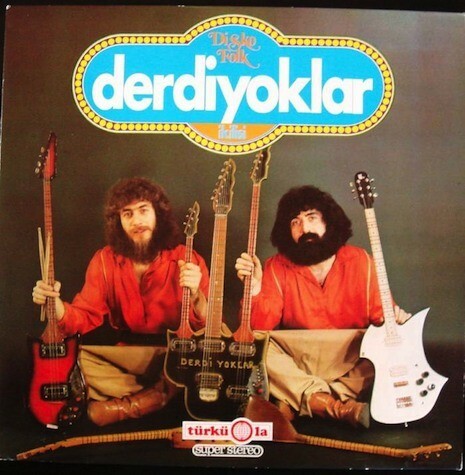 Earlier this year Spanish label Guerssen released a 1979 album by Derdiyoklar Ikilisi—a duo of Turkish emigrants living in Germany—called Disko Folk. The band made its living performing for fellow Turkish emigrants at weddings and "circumcision feasts" (per the press materials). As best as I can tell, the pair made several records in the late 70s and early 80s. Apart from their impressive coifs and beards, Ali Ekber Aydogan and Ihsan Güvercin don't have much in common with Turkish psych artists—and their music bears little relationship to disco. On the other hand, the group's melodies are distinctly Turkish, and on the whole the record sounds like cleaner, more danceable Anatolian pop. Aydogan is a fine singer, but it's his quasi-rock playing on the electric saz that distinguishes Derdiyoklar Ikilisi from most of the Turkish music I've heard, his twangy leads snaking among Güvercin's strolling rhythms (I'm still trying to figure out the three-necked hybrid instrument on the cover—it's part saz, part guitar, and part . . . something). Below you can check out an album track called "Halay." Much more pleasing to the eyes than the static album-cover image in the "Halay" video is the second clip below, recorded during a 1984 Derdiyoklar Ikilisi performance. It's pretty lo-fi, but that doesn't make it any harder to appreciate Aydogan's showmanship: he interrupts his own trancelike poses with bursts of movement and some hilarious behind-the-back saz-plucking while shuffling around in his baggy Anatolian trousers. And when the camera pans left to include more of the audience, you can see that the only people really paying attention to him are a bunch of little kids. About six minutes in, he collapses to the ground, seemingly exhausted by the intensity of his performance, while Güvercin continues to play unfazed.